Get moving! One of the worst things we can do during a holiday is sit still. The latest health research has shown that being sedentary has many, many negative effects on our health. Rather than spend another weekend sitting and increasing your chances of developing one of the illnesses tied to sitting, make it a goal to get up and get moving. Whether you spend a day exploring a nearby park or you turn your Netflix binge into a workout session, adding some activity to your weekend can make your weekend healthier overall – as long as you stay adequately hydrated, of course! Use sunscreen. Don’t forget to protect your skin during your holiday! If you have any upcoming plans that involve being outside, sunscreen is a must – yes, even in Pittsburgh! Experts have found that 80% of UV radiation still reaches the Earth’s surface through cloud cover. So if you spend any time outdoors and under the sunny – or cloud-filled – skies this weekend, be sure to use and correctly apply plenty of sunscreen! Your skin will thank you for years to come. Keep your meals light. Many of the foods that we like to indulge in on the 4th of July aren’t particularly healthy. Rather than settle for unhealthy foods all weekend long, try heading to Google for ideas on how you can turn your favorite dishes into lighter snacks and meals. There are also a few habits and tricks you can use to minimize the amount of food you eat if you head out to a party. Both of these ideas will help you enjoy just the right amount of your holiday treats. Handle (and store) food correctly. The last thing you want is to visit the hospital because of a serious case of food poisoning. Unfortunately, improperly preparing and storing food could leave you feeling sick days after the 4th of July is over. So before you begin cooking or putting your table spread together, it’s a good idea to brush up on the rules and guidelines on food prep. By properly preparing food, and ensuring that you’re careful if you keep any food outside on a BBQ or picnic spread, you can enjoy your 4th of July meals and still feel well enough to enjoy a lazy Sunday afterward. Grab some earplugs. Fireworks are a 4th of July staple. They’re also seriously bad news for your ears and your hearing. 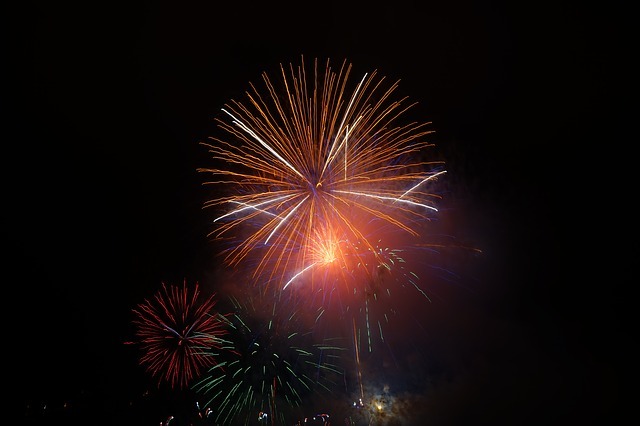 Experts have found that fireworks have a sound decibel of 150. Remember, ear protection is recommended if you are being exposed to decibels that reach higher than 85. And if you’re exposed to a high decibel sound for the right length of time, you could suffer from permanent hearing damage. So before you run out to watch the fireworks, grab some earplugs – and if you forget them, just cover your ears. It’s much better than the alternative! These five tips are each an easy way to make your 4th of July a little healthier. By combining them and sticking to them, you’ll be able to enjoy your holiday knowing that you’re also caring for your health and your body in the best way possible. If you have any additional concerns or health needs you’d like to discuss before the holiday, contact your doctor at our offices today so that we can review things with you before the celebrations start!